Deep Fryers are found in most commercial kitchens. Our commercial fryers are quality pieces of restaurant equipment that last for years in the commercial foodservice industry. Trust the restaurant supply superstore for your restaurant equipment wholesale Deep Fryers and fryer cleaners. Conagra Chopped Onion Corn Fried Fryer Saver - 40 Lb. Glit Disco Regular Fryer Filter Cone - 10 in. Glit Disco Fryer Boil Out - 8 Lb. 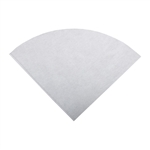 Glit Disco Fryer Automatic Filter Paper - 17.5 in. x 24 in. Update International Rectangle Wire Fryer Baskets With Coated Handle - 12.88 in. Update International Rectangle Wire Fryer Baskets With Coated Handle - 13.25 in. Wholesale Deep Fryers are a valuable asset to any restaurant kitchen for tasty chicken fingers, french fries and more.